The new organ is based on the soundboard found in recent years at Wetheringsett in Suffolk (hence the name). It was discovered during alterations to a farmhouse, and may have been a dairy door. According to tree-ring dating the tree of which the original soundboard was made (from Baltic oak) cannot have been cut down before about 1525. 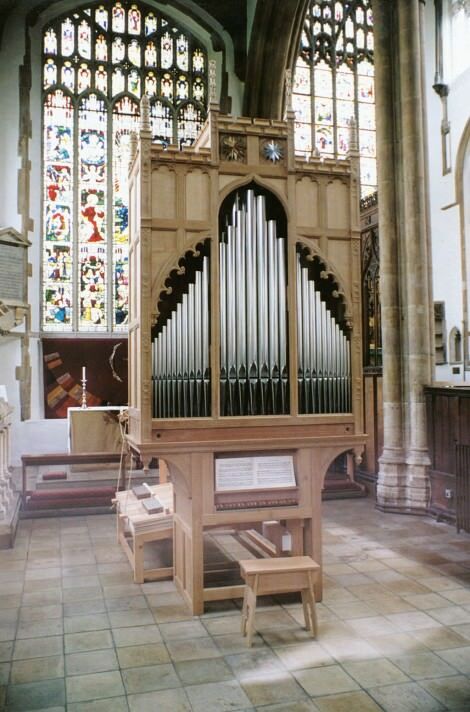 The likeliest local church for this organ is at Debenham, a large church which bought an organ in 1525. It is likely that this organ stood on the floor, or against the wall in a gallery, and was probably the main organ of the church. It is known that there were continental organbuilders being paid for new parish church organs in the first half of the 16th century in England, but the indigenous characteristics of this organ suggest that this organ was made by an English builder, probably fairly local, since there were some well-known East Anglian builders. These characteristics can be summarised as: long, fully chromatic key compass, choruses of wooden or metal pipes of the same scale and style, each with its own slider, and a voicing style familiar from 17th century English organs. Stoplist: The pitch and scaling of the stops are indicated by the spacing and the toehole sizes on the old soundboard. The order is that of the sliders and stop knobs, from the front. Key compass: The key compass is C to a², 46 notes, which is the number of grooves in the Wetheringsett soundboard. This compass matches the ranges needed for the surviving repertory. The two C organs at All Hallows by the Tower in London (1519), and Holy Trinity Coventry (1526) would also have had an upper limit of a². This key compass allows for techniques of transposition by the player, which may have been quite subtle (by a fourth, a fifth or a tone). Pitch: The nominal pitch is 5ft, i.e. a fourth above singing pitch. 5ft Principal ranks were the basis of the two organs mentioned above. For the actual pitch I have chosen the pitch of the earliest unaltered English pipes (the dummy pipes of the 1630 Dallam organ now at Stanford on Avon), which are about 1½ semitones above A440 at singing pitch. We have to assume that this pitch pre-dated use alongside choirs, but that it encouraged subtleties of technique in ‘accompanying’ which we have yet to learn. Tuning: The tuning system is the tuning system recommended by Arnolt Schlick in his Spiegel der Orgelmacher published in Heidelberg in 1511, and intended as a guide for good practice throughout the Holy Roman Empire. He was the first writer to give a recipe which mentions every note of the scale. It is a modified form of mean tone tuning, with good (not pure) major thirds and the wolf spread to some extent over neighbouring fifths to allow some modulation (though ab for instance is still much closer to being a g#).